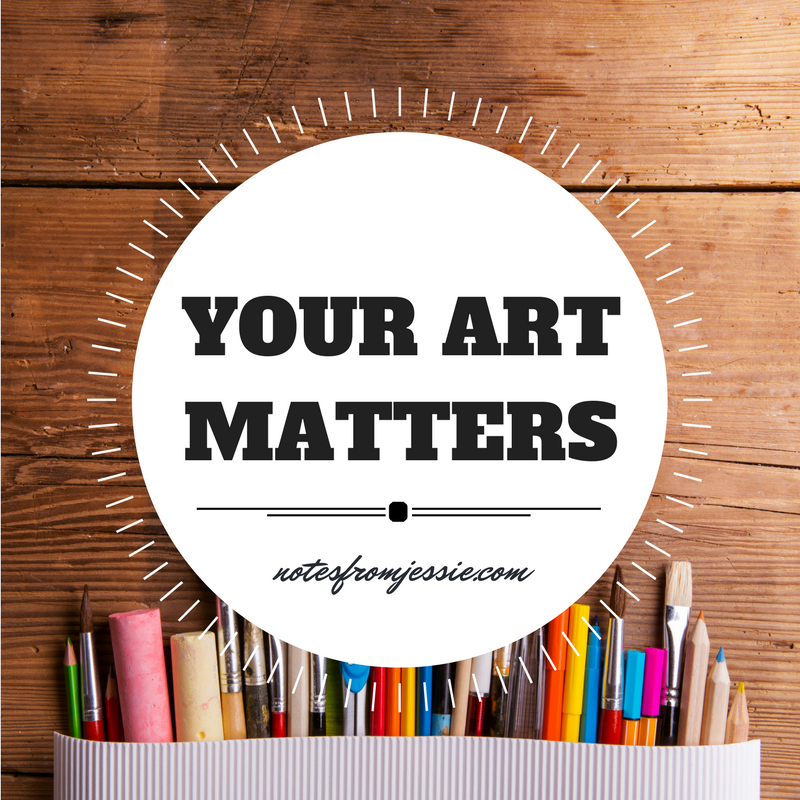 It might not always seem like it, but your art matters! The things you do in this world matter. They count. You matter and you count. Even if nobody thanks you or praises you. Even if you don't hear a fantastic story about how your work changed someone's life. Don't believe me? Still don't think you're an artist? All the work you’re doing towards that thing you’re doing, the tiny steps forward, the little bit here and there, the embarrassment of what feels like failure, the lack of recognition, the waiting and listening: it all counts. It's easy to think that hobbies and creative pursuits aren't important because they don't cross things off our to-do lists. Unless you happen to make a living by creating things, your art likely doesn't provide for you, pay your bills, or seem like a productive pursuit. Can I just encourage you to think of yourself as an artist? Even if you don't paint, draw, play an instrument, dance, write, or sculpt, you are an artist. You make things. You create things. You and I were created in the image of God, which means we were made to be like Him. He created us-- made us His masterpiece, His workmanship. He's an artist, and so are we. You have the ability to contribute lovely things to the world. You can create something out of virtually nothing. Even if those things don't look particularly artistic to others. What would our world look like without the things people have created? Can you imagine a life without books, paintings, sculpture, music, movies, landscaping, or fashion? We would have none of those things if people weren't willing to share their art with the rest of the world. And if your artistic pursuits don't appear to be productive or useful, so what? If they bring you joy, make others happy, and provide a way for you to share your heart with the world, then it's worth pursuing. Working to produce something of value teaches us things, even if the fruits of our labor aren't lauded as being inherently valuable. Through the work we put into our pursuits, we learn time management, hard work, ambition, problem-solving, creativity, brainstorming, persistence, and more. We gain great life skills! And whether we do it for work and make money or do it for a hobby and relieve stress, creating things is deeply ingrained in who we are. So paint that picture. Write the book. Start the company. Take the pictures. Enroll in the course to hone your craft. Devote time to your art. And then share it with the people around you! Remember that your art matters. Do you consider yourself an artist? What kind of art do you make? I'd love to hear from you in the comments!